This article explores the phenomenon of broadcast interviews with the owners of large Russian businesses. Using the example of Hard Day’s Night, an interview program on the private television channel Dozhd’, the article takes audience complaints about the interviewees’ evasiveness as a starting point for a discussion about the role that broadcast interviews play in maintaining political order. The argument unfolds in three steps. Firstly, on the basis of research interviews with channel staff and video analysis of the program, I establish a participation framework of the interview, allowing for the elucidation of the specific obligations the interviewee fails to fulfill. Secondly, I study in detail the interactional organization of the interview, using an original method of analyzing video clips along side the hosts of the program. I identify a set of implicit impersonal rules that guide what the owners of big Russian businesses can say publicly about high-ranking state officials. Finally,the article focuses on the interactional role that journalists play in the organization of the interview by using these rules as a background scheme for their actions. 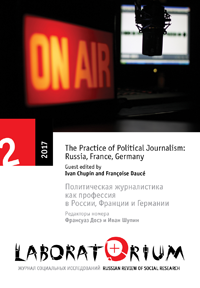 I conclude that the viewers’ and journalists’ belief that the interviews provide an opportunity to demonstrate the individual qualities of the interviewee, while the social and interactional contexts of this demonstration go unnoticed, contributes to the reification of the submission of the owners of large Russian businesses to high-ranking state officials.